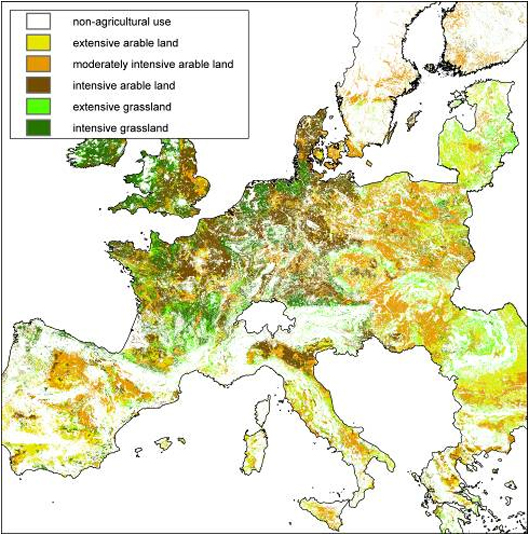 A new, high-resolution, map of land use intensity for the European Union is now available. The dataset has a spatial resolution of 1 x 1 km for the entire EU and is valid for the reference situation in 2000. Databases of land use normally focus on representing land cover based on remote sensing observations and lack information on actual land use intensity (Verburg et al., 2011). 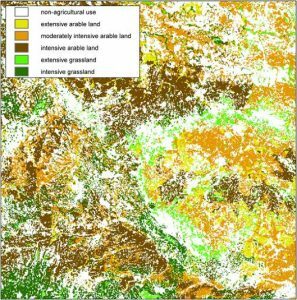 To represent the intensity of agricultural practices a land use intensity map was constructed for this study. Arable and grassland land cover as designated in the CLC2000 land cover data were re-classified in respectively 3 classes of intensity of agricultural management for arable land and 2 classes of intensity for grassland. 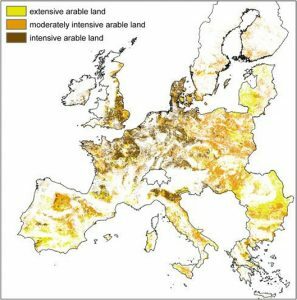 Temme and Verburg (2011) proposed to use a combination of European level databases to construct land use intensity maps with separate methodologies for arable land and grassland. Building on this approach a new map was constructed for the entire European Union. In addition, the approach was modified to better address the needs for this particular study, which is using the intensity information for a biodiversity indicator. As an appropriate indicator for the intensity of arable land management nitrogen application was selected. Nitrogen application has a high relevance to agro-biodiversity (e.g. (Kleijn et al., 2009)) and is commonly used as a land use intensity indicator (Herzog et al., 2006). 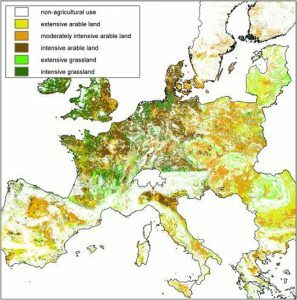 However, there are no EU wide data, at high spatial resolution, showing the spatial distribution of nitrogen application. The highest spatial resolution of data available are sub-national administrative units (NUTS2/3 level). For each administrative unit the nitrogen input levels are reported per crop type in European statistical data collected within the Farm Structure Survey (FSS). 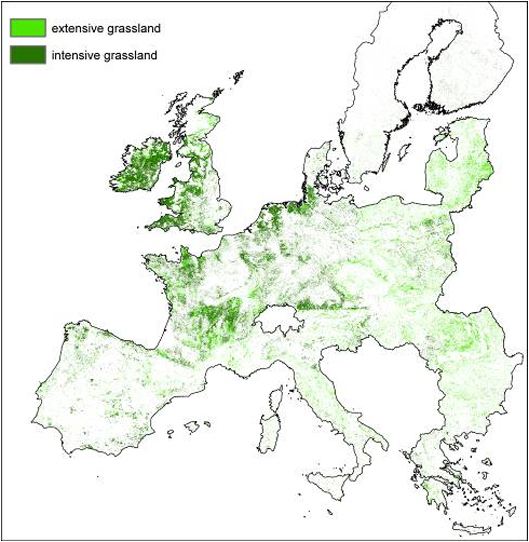 Another European level database, the Land Use/Cover area Frame Statistical Survey (LUCAS) (Bettio et al., 2002; Jacques and Gallego, 2005 ) provides point-based observations of crop type from the years 2003 and 2006 for about 150 thousand sample points across agricultural areas in the European Union. Each point of the LUCAS dataset was assigned the crop-specific nitrogen application rate corresponding to the crop-specific application rate in the administrative unit. The underlying assumption is that variation in nitrogen application within an administrative unit can be proxied by the cropping pattern. Nitrogen application rates are then classified in three classes: low (<50 kg/ha); medium (50-150 kg/ha) and high (>150 kg/ha) based on the relevance of these nitrogen application levels for biodiversity (Kleijn et al., 2009). Using the LUCAS sample locations as individual observations the spatial diversity of nitrogen application was associated to a set of environmental and socio-economic location factors using multinominal regression. The estimated regression models were used to predict the intensity classes on all locations classified as arable land using on the socio-economic and physical conditions of these locations. Location factors included are topographic conditions, soil and climate conditions, population density and accessibility. A full list of all factors accounted for is provided by Temme and Verburg (Temme and Verburg, 2011) and Verburg et al. (Verburg et al., 2006). The regression models were estimated for all countries separately to account for national specific relations between agricultural intensity and location factors, often originating in different cultural-historic development pathways. For the few countries without LUCAS data regressions estimated in neighboring countries were used and extrapolated. The applied regression models provided probability maps for the three arable land intensity classes. A hierarchical procedure was used to allocate the total areas of the individual land use intensity classes as reported at the level of administrative units to individual pixels. First the area of the highest intensity class was allocated to the pixels with the highest probability for that class. In a next step the least intensive areas were allocated to the locations with the highest probabilities for that class. The remainder of the locations was classified as the medium intensity class. 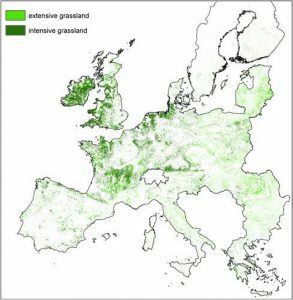 For grassland a different approach was taken as for arable land similar to Temme and Verburg (2011). For the LUCAS observations of grassland the nitrogen input was estimated based on the local stocking densities with cattle. Stocking densities were derived from the livestock maps of (Neumann et al., 2009). We assumed a uniform quantity of 100 kg N/ha per cow per year and reclassified the observations into two classes: intensive grassland with > 50 kg N/ha and extensive grassland with < 50 kg N/ha. Similar to the procedure for arable land country-specific logistic regression models are estimated and used to downscale within the administrative units the areas of the different intensity classes to individual locations.